Wish I could say this painting was completed on location but that would be wrong. I painted this from a photo taken on a road trip to the Yakama Reservation that did not allow me time to set up and paint. However, the only reason I was able to interpret this photo accurate to place and time was all the work I have done in the field. 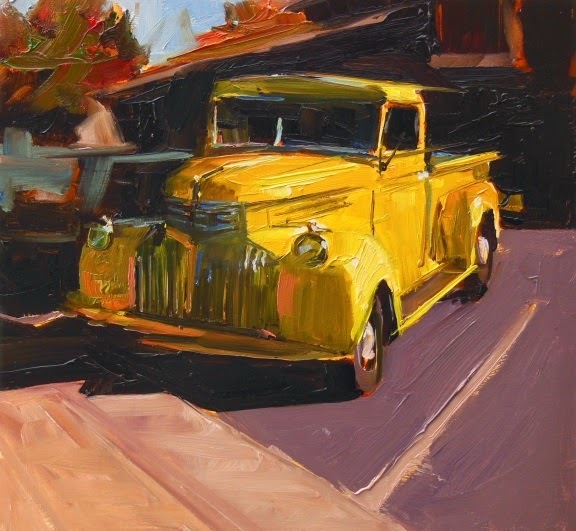 Bottom line,( you will hear this from most landscape artists) If you want to use photo reference for painting and those paintings to be believable, you must paint from life as much as possible! BTW, my destination on that road trip was to participate in "Art Day" at Hope Fellowship Church in White Swan, WA . 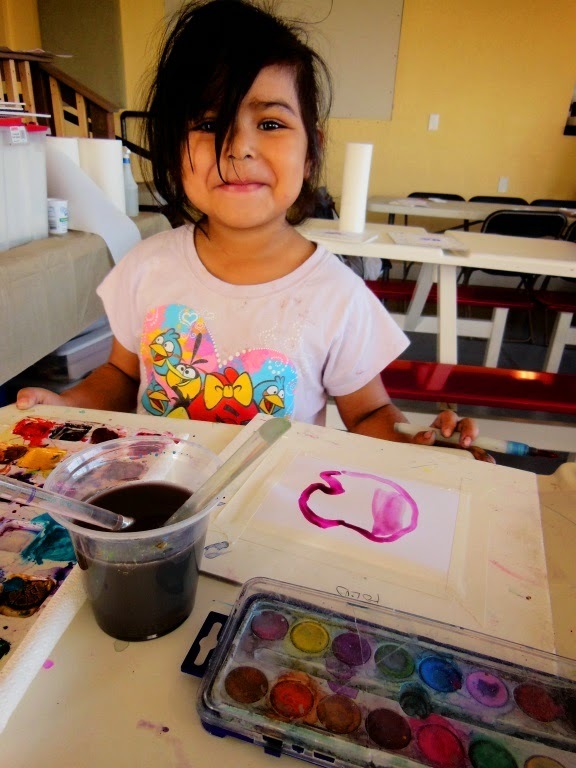 I taught watercolor to an enthusiastic group of native kids. They are very creative and we all had a lot of fun! If you would like to learn more about the Sacred Road Ministries work on the reservation check out the website HERE. Be sure to check out the videos on their youtube channel! This painting is now posted on the Daily Paint Works Auction Site. Click HERE if you would like to place a bid. I posted this painting on my facebook page and received an enthusiastic response. When I get that kind of buzz about a painting I know it has potential to go larger or be saved for the many juried competitions that are coming up in the summer. That can be hard when many opportunities are open to sell the work. For the artist it can really pay off to save your best work for competition. Your return on that kind of delayed sale gratification can be huge in recognition, commissions,award money and the potential to sell the painting. So far this spring I have entered the Oil Painters of America national exhibition and had my painting "Under the Fremont Bridge' accepted! This was a big surprise! I will tell more about this show in my next post. I have also saved "The Underground Tourists" for the Edmonds Art Festival juried exhibition. I will find out in May if it is accepted. 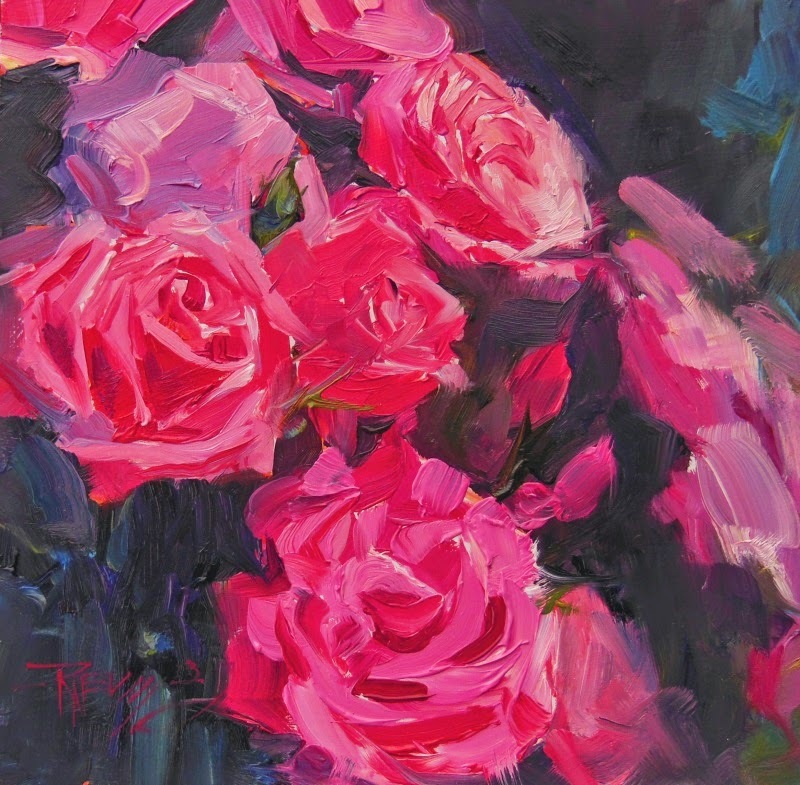 Think twice about selling that winner to the enthusiastic collector while it is still wet on the easel! After all it is your best creative work and should be used to further your career in the best job on the planet!! Happy painting! What is it about umbrellas? 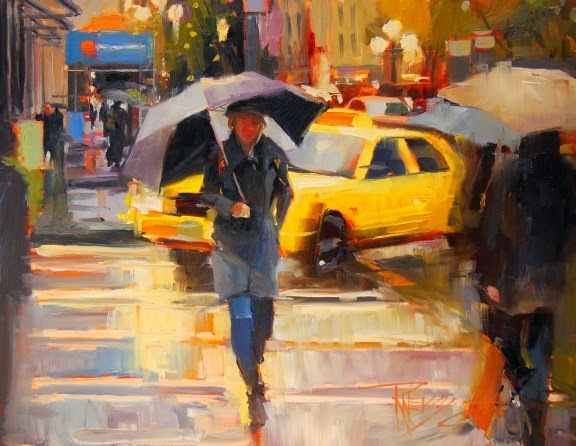 I love the challenge of painting them especially in the context of city life, rain and reflections on wet pavement! We get all of that in Seattle and plenty of it! 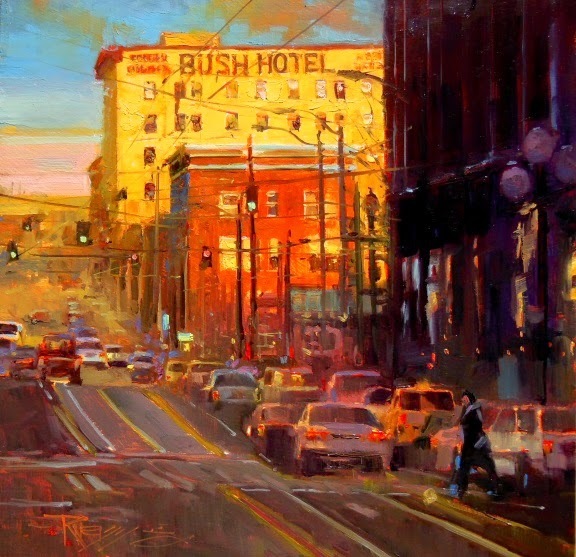 This painting is available through Alki Arts located at First and Seneca in Seattle! Contact Diane Venti (206-538-0099) for purchase information. We have been enjoying a stretch of beautiful spring weather while the east coast digs out of yet another killer snow storm. I have been taking advantage of it by heading out to paint every chance I get! I'm not the only one! 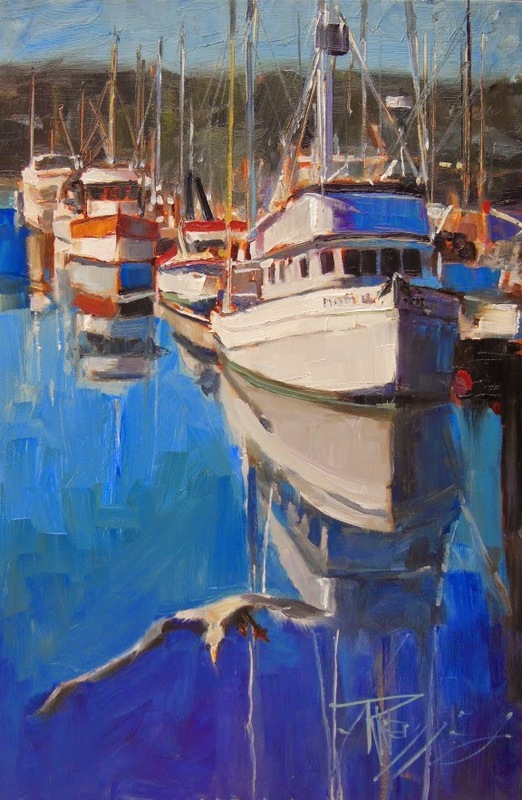 While painting at the marina in Poulsbo last week I ran into my friend Nicole Galinas. She was taking pictures and enjoying the sunshine too. We had talked earlier about doing some videos of my painting demos since she went to school for graphic design and knows her way around computers way better than me..
.I said "Hey Nicole are you still interested in doing that video for me and she said "Sure when do you want to do it" I said "How bout right now" She said "Well , all I have is my phone to take videos" I said.."Let's do a short promo and see how it turns out" This is what Nicole came up with! 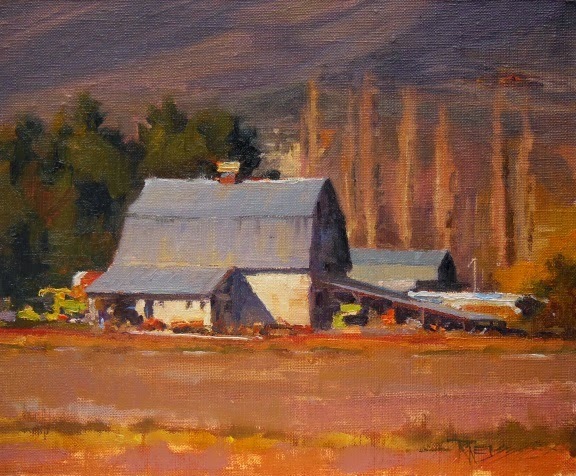 If your interested in seeing this painting and other plein air work... plus,...watching me paint! 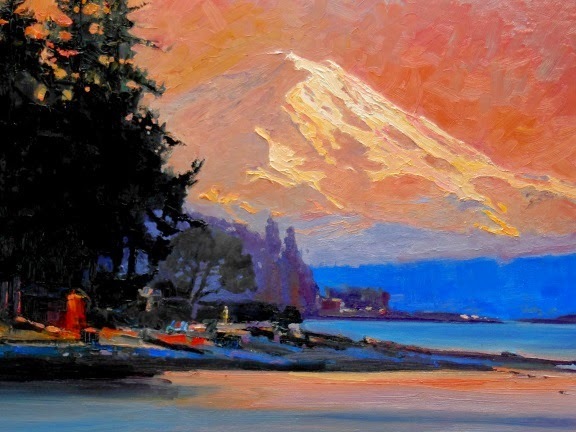 Come to the Second Saturday Artwalk in downtown Poulsbo this month on Sat. the 14th at 5:00pm ! 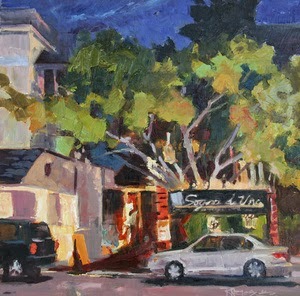 I will be outside the Carrie Gollor Gallery painting my "Spring version" of the Sogno de Vino restaurant which has an amazing magnolia tree in full bloom in the courtyard right now. A couple weeks back I did some plein air painting on Bainbridge Island near where I was exhibiting a show of my work at the Treehouse Cafe. My friend Darrell Anderson came and painted with me one day and then I went back again with Jim Lamb another artist friend. It was late in the afternoon on a crystal clear day when Jim and I went to check out a favorite spot near Point White and this is the view that greeted us. The light was quickly fading and there was no time to set up to paint so we spent some time taking pictures. This painting was done from those photo references and my memory of that amazing sunset.